Now that the dust has settled on the NFL Scouting Combine, it is time to look at who helped their stock and who hurt it the most in Indianapolis. This years’ story-lines included the always charismatic Jameis Winston absorbing media attention and Connecticut defensive back Byron Jones setting a world record in the broad jump with a 12’3 leap. While 40-yard dashes, cone drills, and other athletic T-shirt drills do not always translate to successful NFL players, they still leave an impression on scouts, media and fans before May’s NFL Draft. Here are twelve players who left an impression. All indications from the media were Fowler displayed great personality and poise in front of the media. Besides that, he displayed long arms and solid NFL size among a crop of questionable true 4-3 ends. He looked good in all the field drills and could be a top 10 pick for sure. White shocked everyone running a 4.35 receiver. Everyone knew he was big and could catch but no one knew he was that fast. He answered every question about getting past opposing defenses with the speed displayed at the combine. He might just be the first receiver taken because of it. 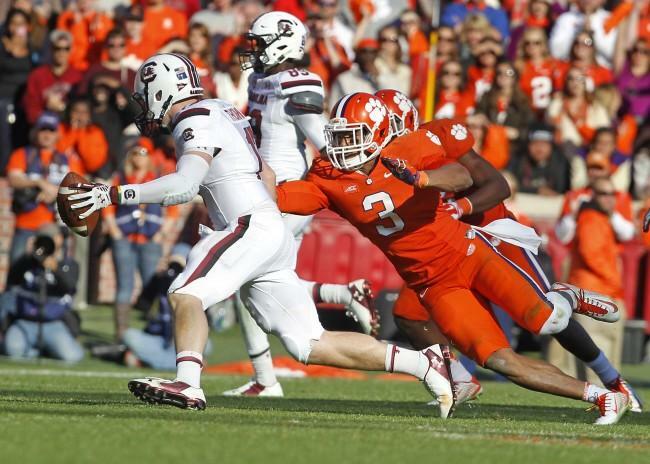 Clemson Tigers defensive end Vic Beasley impressed at the NFL Combine last week. Photo courtesy of TNS. Any questions about Beasley’s size were answered. Not only did he come in heavier than expected, he managed to keep all of his explosiveness. He showed a solid 41 inch vertical jump and 4.5 forty. Most of all he did 35 reps on the bench press, proving he can set the edge at the next level with that kind of strength. Strong was on the fringe of being a late first or early second round pick due to his big frame and college production. With receivers high in demand his stock will jump as he killed any questions about his speed with a 4.42 forty yard dash. Williams had more to lose than gain at the combine being heralded as the top overall prospect among most draft gurus. Still, he had the outing most expected and proved he is enough of an athlete to warrant a No. 1 selection if Tampa Bay passes on a quarterback. A solid bench press at his pro-day will be the next test for Williams. FSU quarterback Jameis Winston lived up to the hype at the NFL Combine, but didn’t stand out as others shined for potential draftees. Photo courtesy of TNS. 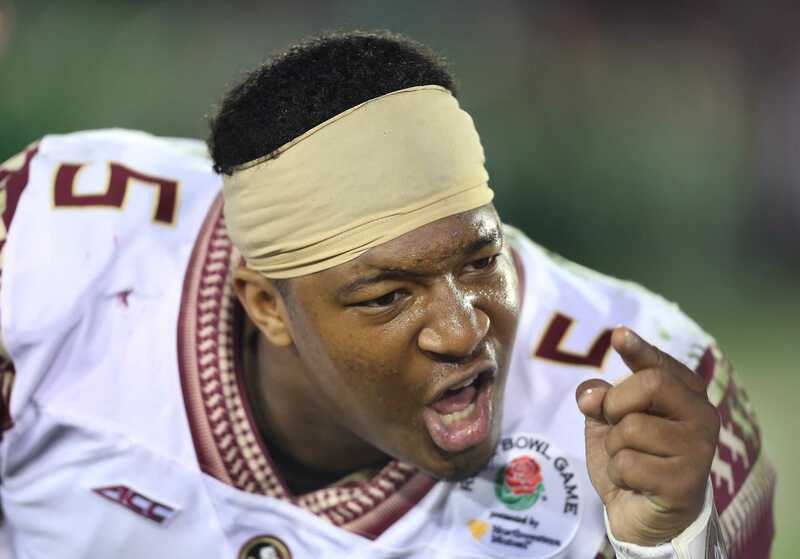 Jameis Winston, Quarterback, Florida St.
We knew Winston was the most polarized athlete in college football. Now we know he might be the best arm talent in the draft. He looked good throwing the ball and a sub five second 40 time will not stop anyone from drafting him in the top five picks. 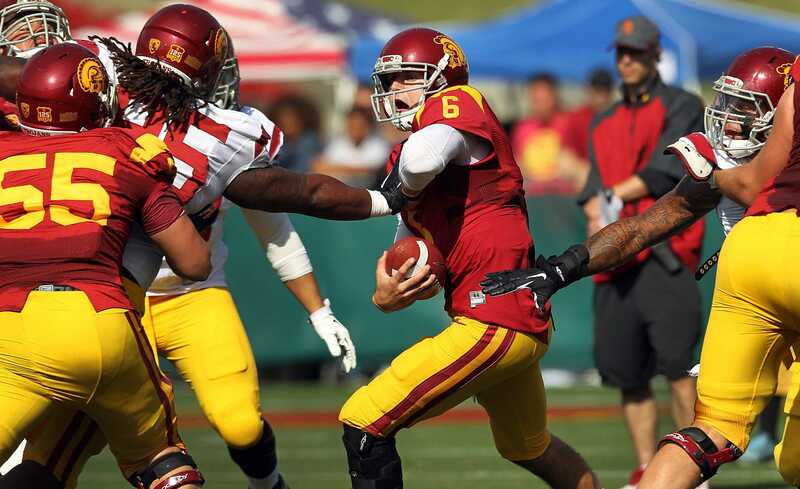 Winston is prime-time leader and quarterback even if he lacks great athleticism. Shelton ran a 5.6 forty, but what did you expect from a mountain of a man? Despite the imposing size, he still moved well enough to show he can play at the next level. Game tape is his biggest strength, but he showcased a high motor in each of the drills he participated in. 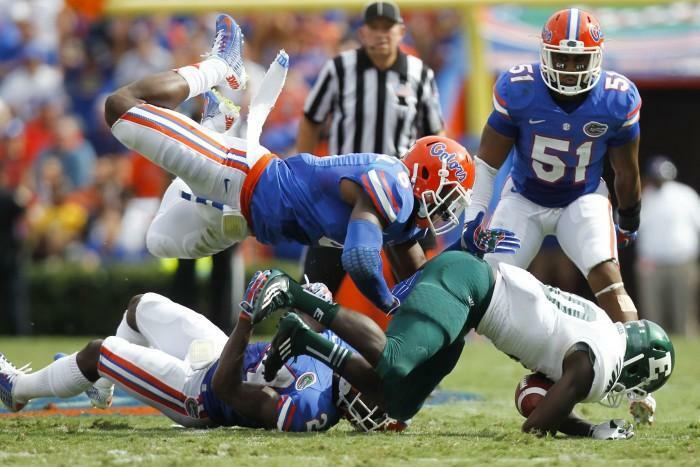 Waynes was already considered one of the top cornerbacks in this year’s draft. He showed up at the combine and ran a 4.31 forty to show he has the speed to play with any receiver. More importantly, he measured at six foot and 186 pounds, which was huge considering many felt the only knock was his size. Gregory’s stock wasn’t hurt too bad. 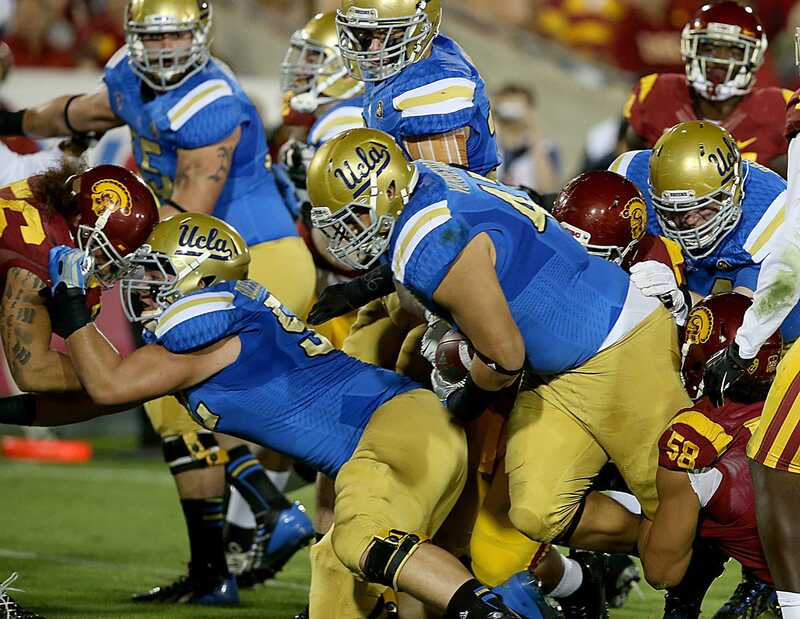 He will probably still go in the top-10 as pass rushers are always in demand. He is raw as a football player combined with his lack of playing weight. He has proven to be weak against the run and benching 24 reps on the bench press does not always translate to the field, especially as other pass rushers stole the show. In an increasingly pass-heavy league, there is little room for slow linebackers. Dawson ran just under a 4.9 forty and now sees himself projecting as an inside linebacker rather than outside. Even with good film over his career, he still might drop to the third and fourth round with other speedier and more mobile linebackers available on the outside and inside. Missouri Tigers defensive lineman Shane Ray was more of a disappointment at the NFL Combine. Photo courtesy of TNS. 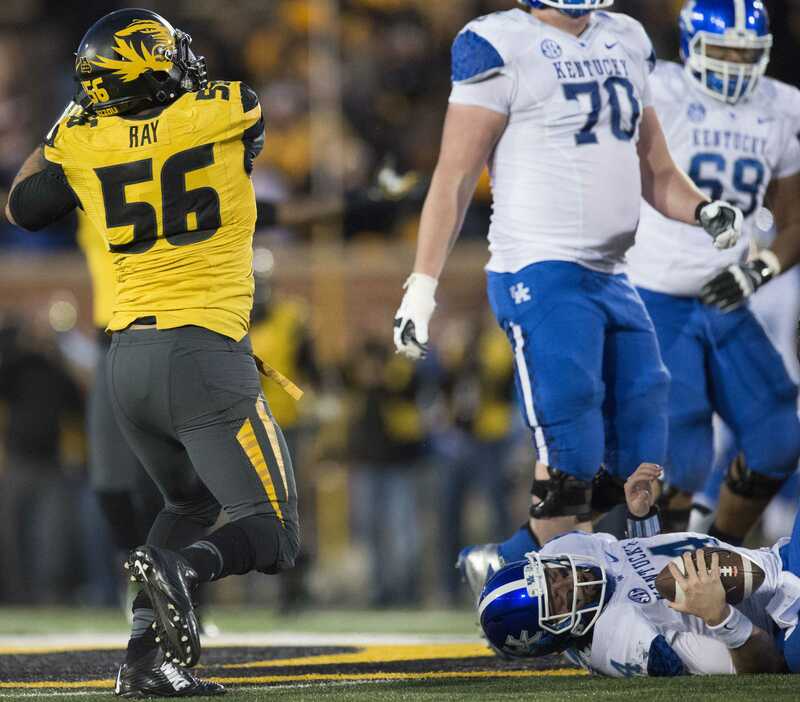 With all eyes on pass rushers like Randy Gregory, Beasley, Bud Dupree, and a few others, this was Ray’s chance to compete and show he is better than them. Unfortunately, he only bench press citing a foot injury from the season. Seeing as he played through it, it is more likely he just wasn’t conditioned or prepared to test well. Strong and Louisville Davante Parker both cemented themselves as the top receivers in the class not named White or Amari Cooper when both ran sub 4.5 forty yard dashes. Funchess would have been in that crop until he ran a 4.7 forty. With not enough strength to play tight end and not enough speed to run past defenders, his stock tumbles.